DRESS REHEARSAL FOR A FALSE REVIVAL? It never ceases to amaze me how supposedly intelligent Christians can so miss understanding Biblical prophecy; they have either missed it, they don’t care, or they are afraid. While Biblical end-times prophecy is unfolding like yesterday’s newspaper and foretells the very thing they are producing, they practice their religious hobbycraft in a cloud of delusion. It all seems so Stupefied and hopelessly inebriated when examined against the backdrop of what the Scriptures have to say to the contrary; and onward they stumble. According to a news release from PRWire titled “Pope Francis To Address Americans At National Mall Event ’Together 2016’ With Special Video Message,” Pope Francis will be joining (via video) evangelical leaders such as Ravi Zacharias, Luis Palau, Michael W. Smith, and Josh McDowell, emerging-church leaders such as Francis Chan, Ann Voskamp, Jennie Allen (IF), and Mark Batterson (Circle Maker) and charismatic leaders such as Sammy Rodriguez and Hillsong for an event motivated by a goal to bring unity to all those who “love Jesus.” The event is called “Together 2016,” subtitled Fill the Mall. It’s been over fifteen years since contemplative pioneer Richard Foster shared his vision of Catholics and evangelicals coming together3 and over two decades since Chuck Colson helped author a document titled “Evangelicals/Catholics Together.”4 It’s been over a decade since Rick Warren announced his hopes to bring about a second reformation that would include people of different religions.5 In more recent days, evangelical leaders such as Beth Moore,6 Franklin Graham,7 and Kenneth Copeland8 have played their parts in helping to remove the barriers between the evangelical/Protestant church and the Roman Catholic Church (something the Catholic Church calls the New Evangelization program9). According to the Bible, we know a time is coming when a global one-world religion will serve alongside a global one-world government, both of which will reject Jesus Christ as the Messiah and Lord. Whether they realize it or not, the leaders and musicians participating in Together 2016 are helping to make that global religion a reality as they participate in this ongoing relay race of breaking down the walls that divide different faiths in the name of unity at all costs. 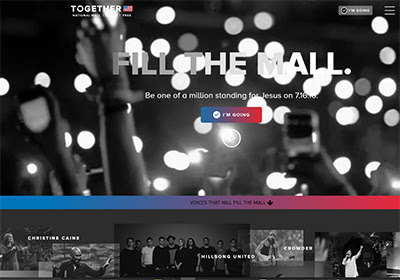 Right now, in America, evangelical and charismatic leaders are calling for a nation-wide revival. But will their revival be a revival from God; or will it be a false revival? And is Together 2016 nothing more than a dress rehearsal for this false revival? If not a dress rehearsal, certainly yet another testing of the limits by our adversary. It seems that he keeps pushing the boundaries to see how much society and the “church” will accept. Are the days of Noah upon us? David, you are so right. The pressure is on and things are beginning to cave-in. I often ask myself why I see these things when others, more intelligent by far, are missing the simple stuff. The only explanation is that there is a real spiritual blindness that has infected this country and the world like a thick fog. But, why do I see these things, I am not perfect nor deserving of any special insight; it is very humbling. I recently had and exchange with some individuals on a popular Christian website and when I stated some of the things I write about here, giving plenty of references, I was attacked and called names and accused of being a Liberal trying to destroy our country. Their response was cruel and hateful and LOUD; needless to say, I moved on. If this meeting would have been a face-to-face I believe I would have tasted my own blood. I have some Mongolian friends who believe that the greatest mission field, right now, is within the Church itself. And, I would have to add, that it must be the hardest people to reach. A false sense of security has been so ingrained in them that it is taken for the Gospel itself. They are thoroughly convinced that God approves of killing for the right reasons, and government sanction and self-protection are right reasons. Where is the lamb and dove mentality of Christianity today? I have been slow to add to the site lately, getting older, tired more often, the good fight is taking its toll, and Summertime is a busy time with our refrigeration business; I’m ready to go home. I’m 68 and my wife keeps reminding me that I have a long way to go if my mom’s age is any indication, she will soon be 96 and healthy in body and spirit, we will see. My dad died at 59 and my brother died at 52. When the Lord is ready, I am more than ready. I will be headed your direction in July. I am taking my mom to see a cousin in Delavan Wisconsin, about a six-hour drive. It’s sad that “Christendom” is so divided over things that should not be divisive. But materialism, politics, and nationalism are rampant within the visible church… I can appreciate your weariness in the battle and longing for a world in which Righteous dwells. At 62, I am not far behind… I hope that your visit to Delavan goes well! Right onh-tis helped me sort things right out. Yes, it is at least the dress rehearsal for the apostasy revival. Know all about it and make the warning rounds all the time. Glad to find another fellow believer who sees these things for what they are! Laying the groundwork for his one world religion. I hear you too on that part, even on discernment blogs the hostility is amazing in the comment sections even on minor points! Au dÃ©but, j’Ã©tais petit et trÃ¨s mauvais en franÃ§ais. J’ai donc fait des mathÃ©matiques. Cela m’a assez bien rÃ©ussi car j’ai fini avec un doctorat en physique. Vous vous Ã©tripez sur > ou >, je pense que vous Ãªtes tous fada.